As Laird arrives on base she goes through a secured gate, and gets out of her SUV to hug soldiers Spc. Christopher Robles, center and Sgt. Randy DeWitt, left. Since June 2003, Elizabeth Laird has greeted nearly every soldier in transit between Texas post and the battlefield. Across the tarmac they come, four dozen war-weary soldiers who have just flown for 18 hours from the sands of the Middle East. Single file they march from the chartered Boeing 757 to the military airfield terminal, sunshine reflecting off their dark glasses. They wear digital camo and tan boots. They grip M-16 rifles cleared of ammo. They carry backpacks and extra bags. This quiet procession heading back to American life snakes up the stairs to the door of the terminal. Across the threshold waits a tiny, gray-haired woman. She is about to interrupt the military's regimented universe, in which crisp salutes are standard greeting and a firm handshake is about as informal as it gets. She wears a floral blouse, an ankle-length red skirt and black Ugg boots. She clasps her hands. She sports a yellow ribbon in her waist-length hair. She sees a bit of herself in these young soldiers who have seen and felt so much. Life has tested her, too. She knows what it's like to feel alone in a big world. Sgt. Michael Flanders is the first to hit the doorway. The woman's arms lift and stretch toward him. He leans down, holding his assault rifle and bag off to the side so they don't bump. She is all of 4 feet 10 inches tall. He is 5 feet 11 inches tall. "Thank you, ma'am," he says. "It is amazing to see her again," he says later. This woman is no stranger to the soldiers. They have seen her before. She was here when they deployed from Fort Hood last year. 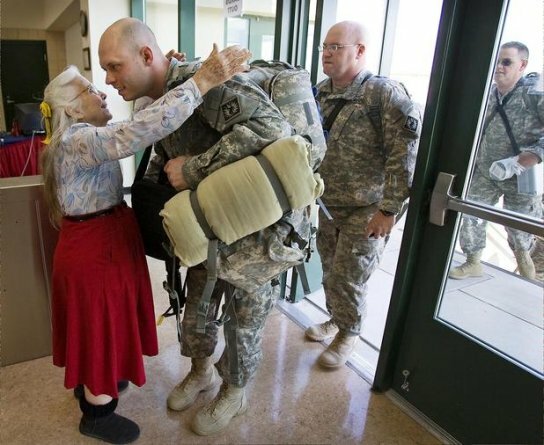 Elizabeth Laird is the official Fort Hood Hug Lady. The Fort Hood airport is her home away from home. It doesn't matter whether a plane filled with soldiers is taking off or coming home. It doesn't matter whether the plane leaves at 3:30 a.m. or arrives at 3:30 p.m. The Hug Lady is here. She wraps her arms around deploying soldiers before they board a plane and around returning soldiers just after they deplane. She is a one-woman welcome wagon and one-person goodbye party. She takes over at the airfield after soldiers have said goodbye to their families at an official ceremony on the main post. When they come home, she's the warm-up act before the big, patriotic ceremony in a gym where soldiers reunite with their families. The Hug Lady, who has her own official Fort Hood business card, has been embracing soldiers since June 2003, just three months after the U.S. invasion of Iraq. She had been going to the airfield terminal as a Salvation Army volunteer. One day, a soldier hugged her. She hugged him back, and then she hugged another soldier, and another. Soon after, Fort Hood's then-command sergeant major, Joe Gainey, saw her in action. "I want you to hug every soldier going and coming," he told her. He even bought her a package of Huggies baby wipes as a gag gift. She has hugged at least 500,000 soldiers in almost seven years, Fort Hood estimates. "If I can bring a smile to their face, if I can lift their spirits a bit, if I can let them know we care," she says, "it's my way of saying 'thank you for what you do. '\u2009"
Sometimes her gig takes only a few minutes. One recent afternoon, 48 soldiers from the Wyoming Army National Guard arrived. It took only six minutes to give all of them hugs. But the Hug Lady stayed on, waiting for the last soldier, who had been assigned to keep an eye on the luggage as it was unloaded from the plane. Sgt. Justin Gydesen finally made it into the terminal long after his comrades had left the building. The Hug Lady was there for him, of course. The Hug Lady is not going to abandon a soldier. The pain of separation is something she has known. She toughs it out and smiles through her pain. Resilience shows in her laughter, which comes out as a series of giggles. Laird is 78, a mother of four, grandmother of 12 and great-grandmother of seven. She grew up on the wrong side of the tracks in Birmingham, Ala., embarrassed by the homemade feed sack clothing she had to wear to school. Her father wanted a son, and her mother, at times, was emotionally distant. She felt unwanted. She graduated high school at 16 and moved to New York City. At 17, she got a job at a research institute on Madison Avenue. She joined the Air Force at 18 and ended up at Lackland Air Force Base in San Antonio. She married, but divorced her husband after he cheated on her. Then she discovered she was pregnant. She left the Air Force, moved back in with her parents and married the former Marine who lived across the street. They had three children, and he adopted the son fathered by her first husband. In 1964, she moved alone to the Rock Island Arsenal in Illinois to study computer programming while her husband cared for the children. 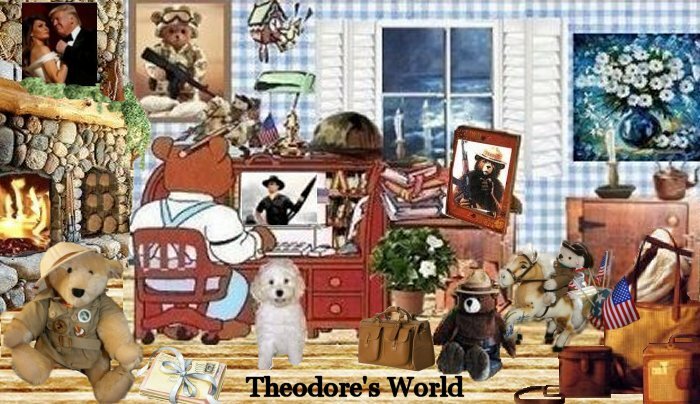 The long-distance separation ended her second marriage, and she moved around the country with her children to various military installations and private computer companies. She married a third time in 1969. The late Ray Laird had been in her computer class at Rock Island. Together, they ran an income tax preparation office in Copperas Cove for decades. Her tax business is called Have Pen Will Travel. She has two dogs, 27 cats and six birds. She also feeds 60 or so wild pigeons in the parking lot of her office twice a day. She is a vegan who listens to Rush Limbaugh. She hasn't cut her hair for 40 years. Ray Laird died suddenly from a blood clot on Jan. 10, 2008. They had been married for 38 years. He was buried in the Central Texas State Veterans Cemetery next to Fort Hood. After the service, she got in her Suburban and drove to the airfield to meet an incoming flight. She got to the doorway just as the first soldier came through. Nine days after her husband died, her eldest daughter, Linda, died of breast cancer in Alabama. Laird's grief was immeasurable. "In a way it was better because you can only hurt so much," she says. "I think it was God's plan. The pain for both of them was so intense. It was good that it went together rather than getting over one and then being hit with a second one." Hugs can heal. Hugs keep her going. On a recent morning, she locks up her tax office and steps onto the running board of her 1999 white Suburban. She's too short to reach the seat without this boost. 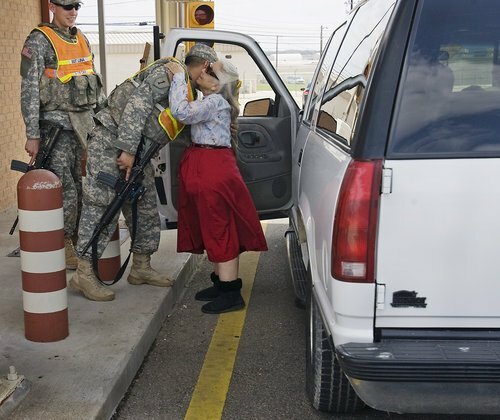 She drives 11 miles to the Fort Hood airfield and stops, as required, at the guard shack at the gate. "You want your hugs today?" she asks the two guards on duty. She climbs out of the Suburban and hugs Sgt. Randy DeWitt, who has to shift his M-4 carbine to the side. "I always remember the sweet faces," he says. Spc. Christopher Robles comes to get a hug, too. Then she's back on her way to the terminal. Awesome! I LOVE stories like this. What a wonderful lady she is!!!! Big deeds can come in small packages. Elizabeth accomplishes a ton of good with her hugs. I feel just a bit of what she is feeling. I have chosen to dive headfirst into doing something that I have always wanted to do- "Supporting the Troops". I started a small business with the only purpose being to raise funds so that I can better support them. (Not boasting, but rather, goading others to do this as well. ): Once a month, either at McDonalds, or the local Ryan's, I buy lunch for a military family. In my area, we have much military, on several installations, from every branch. The sound of their aircraft over my place, seeing so many in BDU's at the Wal-mart, hearing the testing going on at the Eglin AFB bombing ranges; all make me feel so very American. Readers: You can do this too! These troops are MY troops, YOUR troops, OUR troops! They do not belong to the sissy in the White House, nor do they belong to the self serving bunch that we call "Congress". These are OUR troops, paid by us, loved by us, and NEEDED by us. Try it, try to say something to any military family that you see, (Wives and children are in this too!). And, don't feel that thanking a Veteran goes unheard, I hear it and love the consideration that caused that. While I was not called on to go to combat, my brothers and sisters in uniform have, and they have excelled. Only this weekend, I spent many hours in the company of US Army RANGERS. Soldiers with combat experience, soldiers with wives and children that they have at times had to leave behind while they went to do their part in keeping you and I safe. Someone said something like: "People sleep peacefully in their beds because rough men stand ready to defend them." Get to know some of these "Rough Men", (and Women), you won't regret it! Frankly, well said. I agree. What an excellent write up for a wonderful lady. I have had the good fortune to be one of those soldiers who received a hug from her. I am in a national guard band and we have played traditional military marches for many incoming planes and it never failed that she was there. One plane was scheduled to be there at 2100 and never got their till 0430 the next morning, but she waited to make sure those soldiers were welcomed.